Did anything happen this year? 2005 has been a slow year for BRS...I didn't really accomplish anything new. I seem to have taken back my theory on the abbreviation of BRS...I've managed to continue using BWRS more often than I've meant to. The v3.0 version of the site was the last site up at the backwood-realm.com address, and restoring it with the new godaddy.com hosting service was more of a bear than I wanted to undertake (changing pic refs and link refs in the HTML would have taken longer probably than designing a new site), so I just rescued things like the LIBv3 download page and this history section. v3 didn't live very long, really...just a short time after v2.1 was killed for a business page (Backwood Realm Web Development), that I axed late in 2004. v3 was up when I wrote the 2004 update to this section. 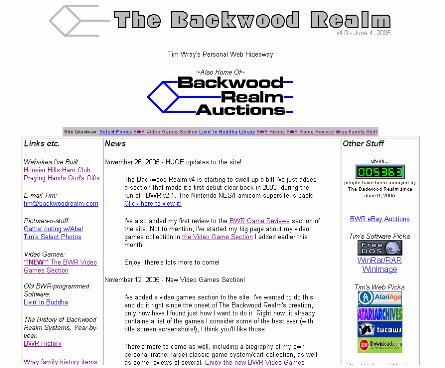 The Backwood Realm v3 site. I liked this design, just would have taken a lot to restore it. Honestly, though, 2005 had very little new development for BWRS. Now, don't get me wrong, I worked on a LOT of things this year. With Ben being so young the earlier part of this year, I didn't get much uninterrupted PC time for development of ANYTHING hardly ever. I did good to keep what I had up and running! I did work on a little DOS programming...but only in bits and pieces...time just isn't my friend any more! Nevertheless, I did begin on a DOS sequel to Livin' in Buddha: Livin' in Buddha II: Era of Strange Happenings. The storyline is sort of a mix of the old "Operation Redneck" story, Livin' in Buddha's original storyline aged by several years, and some other stuff. It's a wicked mix of my E3 program, my RealmScript and TeRDscript scripting languages, and some fresh code for the front end. 99% of the text, prompts, and ASCII graphics are done using RealmScripting, and a small portion (very small) is done using TeRDscripting (Mostly the map editor for E3.) It's going to be a True BWR creation, basically a game written in a language I designed myself. Some screenshots of the creation thus far are included below. That's pretty well it for 2005, I think. Will I actually get any of the above program done? Well, as of this minor update in 2007, nope, because it really isn't going to be useful in the future. Just a fun thing I managed to get working once...now it's just a conversation piece, along with all the previous QB stuff I wrote and compiled back in the 90s.